Fishing Rule #1 - bbPie Electonics, Inc. Choose Size: Required 3 Ft. 4 Ft.
bbPie Electronics, Inc. is proud to present U.S. Patented Fishing Rule #1. 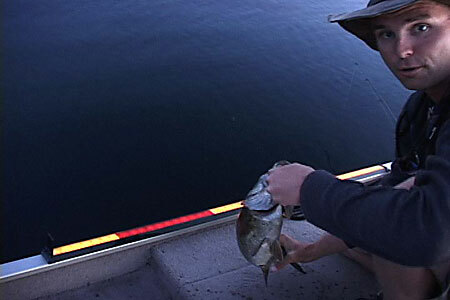 Fishing Rule #1 is a back-lighted fish measurement ruler that surface mounts to any fishing boat. The unit is powered by the boats own 12v system. Any ruler can be used during the day, with the Fishing Rule #1, you can now have your ruler light up for those early mornings, late evenings, or all nighters. The Fishing Rule #1 also helps in size minimums or slot measurements. The Fishing Rule #1 comes with semi-transparent colored overlay strips, you cut to length, to highlight these measurements. The overlays are reusable though inexpensive enough to be disposable. You can write on them with a permanent marker to indicate your favorite lake, for which the length was created. Highlight 0"- 15" for a 15" minimum size limit or highlight 15"-18" if this is a particular lake's slot for a specific species. With using the highlighted areas, a fish can easily be determined whether it is a "keeper" or not and be returned to the water quicker to fight another day. Fishing Rule #1 is a quality piece of equipment. The unit's rugged black powder coated aluminum enclosure houses super bright LED electronics to illuminate an amber acrylic display that resists scratching and is easily cleaned. 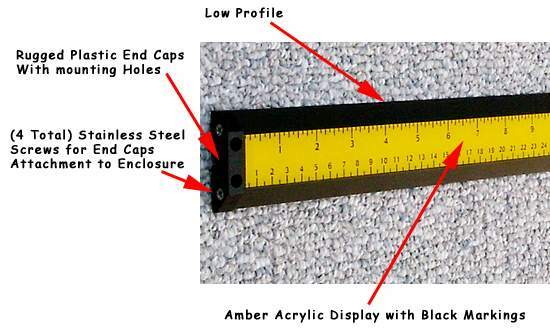 Measurements indicia are displayed on a large 1" wide lens in inches and cm. The Fishing Rule #1's low profile is just over 1/2" in height with tapered edges and the whole unit is strong enough to be mounted on the deck of your boat, though also can be mounted on the floor, side gunnels, or bench seat. Mount with the screws provided, or use Velcro for semi-permanent mounting or a double sided adhesive tape. Fishing Rule #1 also comes in two lengths, 3FT. or 4FT. A wonderful addition to anyone's fishing boat! Large 1" wide display with easy to read measurement indicators. 3ft. or 4ft. ruler length options. 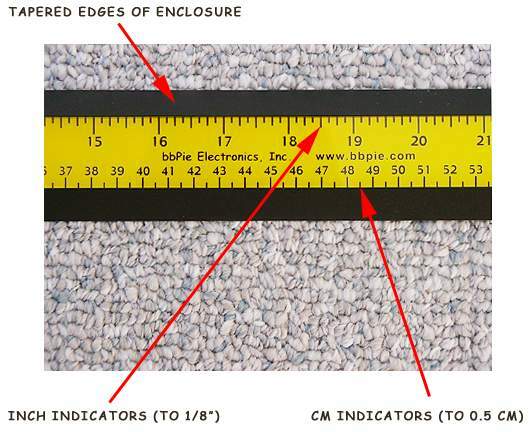 Measurement indications in inches and cm. Powder coated black rigid extruded aluminum enclosure. Surface mountable with screws (4) on two plastic end caps, attached to the enclosure with (4) stainless steel screws. Non-polarity specific (2) wire connection on 12ft. exterior grade cable that is able to be routed out the side of the end cap or hidden routing directly below the end of the enclosure (recommended installation). Super bright LED backlighting - no bulb replacement ever necessary. Red colored overlay, user definable in length, to specify fish size regulations or "slot" limit regulations. Dimensions 36.8" x 2.1" x 0.6" or 48.8" x 2.1" x 0.6" including end caps. 12VDC 200mA (3ft. rule), 250mA (4ft. rule). Must be fused at 750mA. "There are a number of reasons the Fishing Rule #1 is the predominant measuring tool on the market today for anglers. It is mounted conveniently in the boat with non polarized leads so even someone who is unfamiliar with installing electrical equipment can have success. 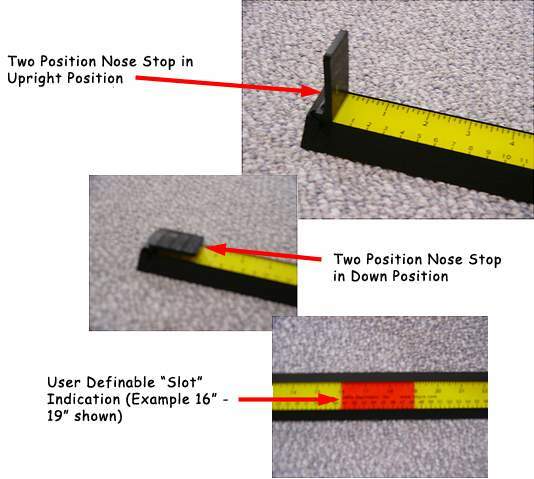 It has a positive nose stop for ensuring accurate measurements every time. It has colored slot strips that are visible for slot allowances like never before. It is backlit for early, low or no light conditions which makes it near perfect in my experience. The Fishing Rule #1 has revolutionized the way anglers measure their fish. This is one of the top three new products I have seen come along in fishing in the past 5 years." Sweet product. Supper easy to read. Everybody needs one of these.